We have a fully working 32 bit DLL with extensive functionality that we have developed over the last 2 years or so. It is working in Outlook 2010, 2013 and 2016 with no issues. We now have our first potential client who have a handful of users with 64 bit Office installed. I have the DLL compiling OK in 64 bit mode (Delphi Berlin). However, as soon as Outlook runs and shows the initial form, it crashes with an Access Violation the moment the user moves the mouse over the form we display on startup. 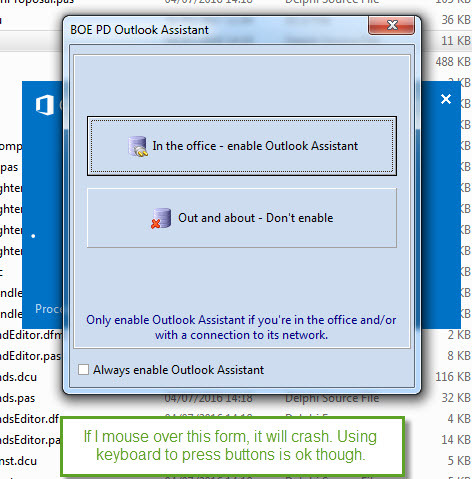 If we use the keyboard instead of the mouse to press the necessary buttons on the form, we can go through into Outlook and see emails, etc, but the moment the mouse is moved inside the Outlook window area it crashes again. The only error I'm getting is c00000005 ACCESS_VIOLATION. Any ideas at all as to where I should start looking to try and track down the cause? We suppose your add-in or a component that you use isn't prepared to be 64bit. Say, if you have a method accepting a window handle as Cardinal, it will crash when in 64bit because the window handle is 64bit in this case. In short, we suppose you have some type(s) used incorrectly. We have hundreds of forms and data modules and a large number of 3rd party components (DevExpress, Raize, TMS etc). Do you have any tips on how to track down where the issue might be? You could start with debugging your add-in and third-party components. You may get an exception which is a dim indication of the location where the real issue occurs. EurikaLog may be of help as well. You can also create a new add-in and move components and blocks of your code to the new add-in one by one. Fixed! For info, it was the EmbeddedWB Web Browser component - now discontinued. It compiled ok in 64 bit but obviously suffered from the problems you described. Even just having the components in the application was enough to make it fail, even if you never opened a form with a Web Browser component on it. Now replaced throughout our application with TWebBrowser, which isn't quite as powerful but good enough.